StarClock ME Series is Astro-Vision’s smartphone applications suiting the requirements of professional and budding astrologers. 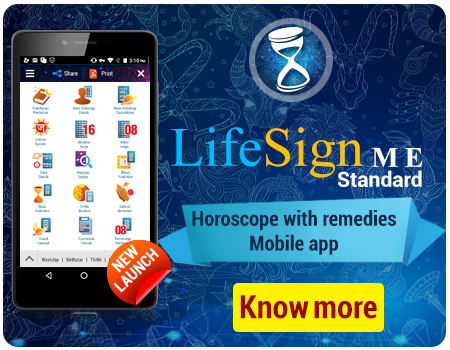 The introduction of this series of products has triggered a revolution, enabling the users to have an inclusive astrology calculations tool that can be carried in their mobiles. StarClock ME Ultimate Plus is the latest in this series offering some new features among the wide range of functionalities. As the name suggests, StartClock ME Ultimate Plus is the advanced version of the previous product StarClock ME Ultimate. All the products in the StarClock ME series have got critical acclaim from the astrology community. 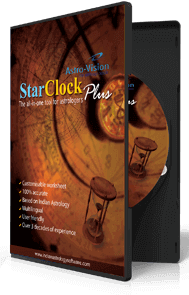 Like the previous products, StarClock ME Ultimate Plus can also guarantee high-level accuracy and deep insight into Vedic Astrology calculations. 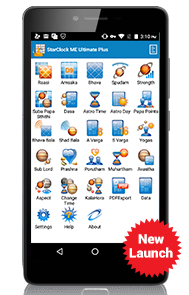 The additional features of this app include Aspect Chart, Lagna change timings, Kalahora, Avasthas etc. 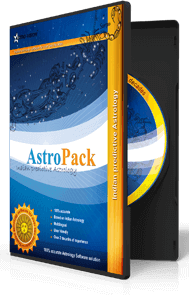 StarClock ME Ultimate Plus covers the stream of Vedic Astrology in an extensive way. 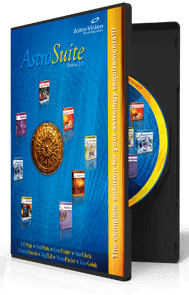 The wide array of functionalities makes it a comprehensive astrology calculations tool apt for professional astrologers and astrology enthusiasts. StarClock ME Ultimate Plus lets you do complicated astrology calculations at ease and with precision. This Vedic astrology app saves your time, lessens the task and avoids manual processing errors. Being a smartphone app, StarClock ME Ultimate Plus lets you carry a comprehensive astrology tool anywhere you go. The wide range of functionalities enables to make thorough horoscope analysis from anywhere, anytime. This Vedic astrology app provides the option to choose regional charts and calculations. It also includes North Indian and South Indian matching methods to check the star compatibility. Detailed information on real-time planetary positions can be known from StarClock ME Ultimate Plus. This Vedic astrology app can generate real-time charts and give the timings/notifications on Lagna and star changes. You can personalise StarClcok ME Ultimate Plus as per your convenience. From the settings menu of this Vedic astrology app, you can choose your preferred language, chart style, chart size, dasa system etc. The discreetly designed User Interface of StarClock ME Ultimate Plus lets you use the app without any difficulty. You can use the app without any training or guidance and set your preferred interface language with ease. StarClock ME Ultimate Plus generates reports in a lucid style and in 4 different languages. It lets you convert the report to PDF too. No network connection required to operate this Vedic astrology app. Like the previous versions, StarClock ME Ultimate Plus works offline. StarClock ME Ultimate Plus is compatible with all android phones. The app takes less memory space and is easy to install. Available in English, Tamil, Malayalam & Kannada languages. Can set your preferred global location and time. Calculations and charts for any preferred date & time. Can save the birth data of individuals for further use.